Here we are in our warehouse home, featured this month in Seattle's Child. We are happy to be the second family featured in a new column called Living with Kids, which is all about how young families find creative ways to grow. Thanks to Andie and Josh for a fun and easy photo shoot! We will be part of Woonwinkel Design Market this weekend as part of Design Week Portland! Come see us on Saturday alongside other design friends like Ladies & Gentlemen, Grain, Fruitsuper Design, ByAMT, Erich Ginder, Blk Pine Bags, Sarah Loertscher, and more. OUR FALL 2014 LOOKBOOK HAS ARRIVED! We've forged a collection that is hard-wearing, long lasting, and full of meticulous and beautiful details. Now we get to share them with you! Next week marks the launch of this latest wholesale collection, with our retail side to follow in September. Our House Tote and Weekend House Tote, two heavy duty utility bags that feature fine leather and copper details, lead the collection. The House Tote (pictured above) has an open top, and the Weekend House Tote has a copper zipper. They are designed and produced in collaboration with our friends at Mimot Studio in Los Angeles. This season we introduce 6 new hand painted prints to our Textile Trays and Plates, including Gingham, above. 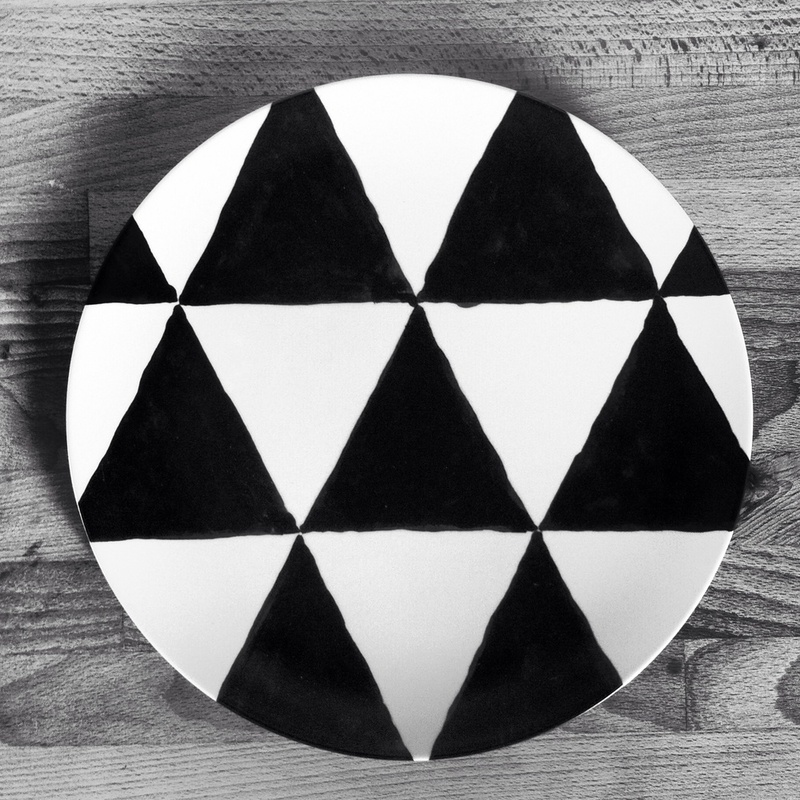 Our popular Textile Plates are now available in two sizes, 8-inch and 10-inch diameter. We are very pleased to offer NW Hard Wood Cutting Board Gift Sets for the fall season, made in collaboration with Chadhaus, our friends and studiomates here in Seattle. Their rich selection of local hard woods and hand cut leather makes a perfect companion to our organic linen tea towels. Each set comes with one cutting board (Oregon walnut or Washington Maple) and two tea towels. For details and more info, please visit our FALL 2014 LOOKBOOK! For pricing and wholesale inquiries, please contact us. Find us at NY NOW next week in Booth #3871 with our friends from JOIN. We have an exciting new batch of products that will debut at NY NOW, including our House Tote! As always, we are honored to show our work alongside the other independent design studios that are our partners in JOIN. See you there! Happy to see our Ledger Tea Towel in the pages of Living! Thanks to Elle Decor -- so nice to work with, and such good company!! We are tickled pink to be alongside some of our favorite textile companies, like Roberta Roller Rabbit and Les Indiennes. Lip service indeed! Thanks to Alexa at Remodelista for including our linens in her 10 Summer Hostess Gifts List, part of Remodista's Summer Rental Issue. I would love to give or receive anything on this list! Then I started reading the rest of the issue and just floated away on a cloud of summer travel dreams . . .
Party in the tea towel aisle! We'll be at West Elm in South Lake Union this Friday night to celebrate the launch of West Elm Local - Seattle edition. Our Spring Tea Towels and R&L Goods Notebooks will be on display. See you there! Objects Made continues to roll across America, and we are thrilled to be a part of it! Last year, we had the pleasure of meeting and working with materials designer Sarah Miller, who curated Objects Made, an exhibition, book and traveling presentation sponsored by Invision, about handcrafted products and the emerging trends they represent. Miller identified 10 design trends that she thinks are changing the American design marketplace. Read all about it in this month's Interiors & Sources magazine. The exhibition will stop in the following cities in the next few months: Portland, Atlanta, Minneapolis, and Houston. Don't miss it! COPYRIGHT © 2006 - 2016, PIANO NOBILE LLC. ALL RIGHTS RESERVED.